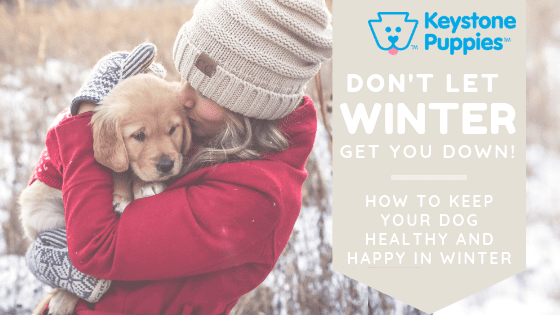 Home Blog Puppy Care Don’t Let Winter Get Your Dog Down! We all know that dogs love going outside. And they need sunlight and fresh air to stay centered and happy. But in some parts of the country, blustery winter weather presents real challenges for many dogs. Dogs with short coats may quickly chill during outdoor exercise in the cold weather. Smaller dogs can feel intimated by snow and cold. Deep snow also presents challenges to many dogs. That’s why it’s important for dog owners to create a winterized approach to outdoor exercise. You’ll make the most of temperate days, make sure your pup has other ways to exercise when the temperatures drop and pay more attention to your dog’s calories and weight during winter months. Even the coldest parts of the United States experience breaks between periods of sub-zero weather. Whether your break is a day or a week, make sure to spend extra time with your dog outdoors when the weather is relatively mild. Take time to give your dog longer walks. Make a point of playing fetch outdoors, or even take your dog to the local dog park. Sunshine and fresh air keep dogs happy, centered, and fit. So spend time outdoors with your dog when the weather permits. Get outside during warm spells, because you WILL be stuck inside once the winter weather returns. Taking full advantage of periods of milder weather will keep your dog more balanced over time, and it’s also pretty good for people. You know the feeling. You wake up and see that snow has fallen. Or freezing rain is pouring down. Or the world has been covered in ice. On these kinds of mornings, it hard enough to find ways to get yourself out of bed, let us think of ways to keep your dog engaged and content. 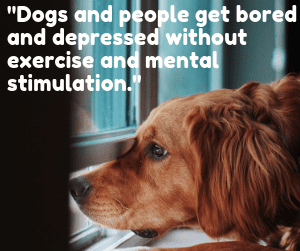 Dogs and people get bored and depression without exercise and mental stimulation. Be sure to check out our blog, “How to Exercise Your Puppy Indoors” to get indoor exercise ideas, including calisthenics, indoor training, games, and more. Even if the weather prevents you from giving your dog vigorous exercise, experiencing new situations or learning new tricks can tire a pup out almost as quickly as physical exercise. Take advantage of indoor time to work with your dog on obedience training, teach him new tricks, or play new games, such as getting him to guess which hand holds a bit of kibble, playing fetch with an empty paper towel roll, or helping your pup to find a hidden dog toy. People aren’t the only ones that put on pounds in the winter. If your puppy is exercising less, his calories should be reduced to prevent weight gain. Even training and toys won’t burn the same number of calories as outside play. So, you must monitor your dog’s weight to keep him healthy and avoid weight-related health issues. Substituting dog treats with bits of ice is an easy calorie cutter. Swap boxed treats with bits of baby carrots or raw bits of pepper or sweet potato. You can also replace up to 10% of your dog’s kibble with raw carrots, peppers, raw sweet potato, or even frozen peas. But before you introduce your dog to new foods, check out our blog on which veggies are safe for pups, and which to avoid. And check with your vet to discuss your dog’s calorie needs and exercise levels before making any significant changes in your dog’s diet. It may be hard to monitor weight gain. After all, different breeds gain weight differently. What looks normal on one dog may be excess weight on another breed. It’s important to know how to evaluate a healthy weight on your breed. Again, your vet should be able to help you understand healthy norms for your breed. 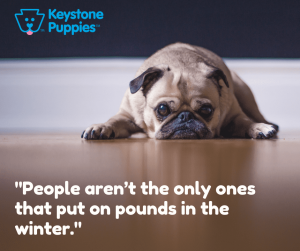 Keystone Puppies cares about the well-being of all dogs. Check with your vet to understand your breed’s cold tolerance and follow their advice on how to prepare your dog for winter outings. If you want to explore dog breeds and traits, click here to learn about more than 200 dog breeds. If you know what kind of pup you want, click here to get started on finding your new best friend.